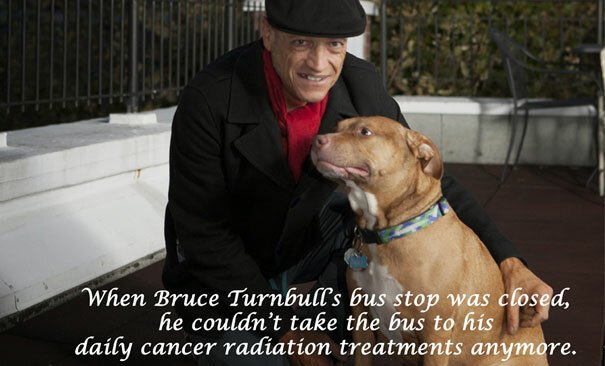 When Bruce Turnbull’s bus stop on Seattle’s Capitol Hill was closed, he couldn’t take the bus to his daily cancer radiation treatments anymore. “It’s just me and my dog,” says Bruce. “Sometimes my sister or friends could take me to Virginia Mason but not all the time.” It was too expensive to hire a taxi round trip every day and he doesn’t have a car. Bruce contacted the Floyd & Delores Jones Cancer Institute social workers and asked if there were resources to help him. Fortunately, a special fund is available from the Virginia Mason Foundation to help people with needs such as transportation, temporary housing and support groups. “We were able to provide Bruce with transportation vouchers so he could make his treatments on schedule,” says Stacy Marini, MSW, LICSW, cancer institute social worker. “When patients really need support to make their care successful we can use this funding to fill the gaps,” adds Kelly Christensen, MSW, LICSW, cancer institute social worker. “The fund also provides for unique support groups, including a men’s cancer group, care for caregivers and holistic healing,” says Stacy. For more information visit the Cancer Institute or to learn more about how you can help, visit Virginia Mason Foundation.